Our longer, heavier 4" scopes are best matched to the rock-solid Gibraltar HD4 mount. 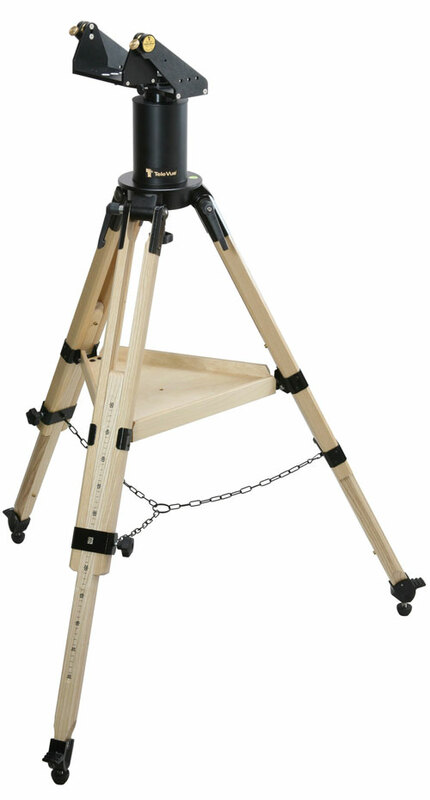 The large bearing surfaces and thick wood legs best handle the loads, especially for high power viewing. Leg extensions raise the altitude axis to 5-feet, still ideally sized for use with our Air-Chair observing stool. Scale on leg extensions allows repeatable setting to desired height. A wood accessory tray ties the legs together for rigidity. Built-in pier allows for high-altitude viewing. A bubble-level is integrated into the tripod base. Metal ground spikes with rubber tips are provided. Sky Tour capable. The Tele Vue Sky Tour computerized object locating system integrates seamlessly with our mounts to put 2,000+ objects within your grasp. Quick setup 2-star alignment allows observing fixed objects without fiddling with latitude, longitude, date or time inputs. Easy to use Guide mode shows you the direction to move the scope in order to center the selected object. Sky Tour adds R.A./Decl. digital position readout (resolution: 1' R.A, 0.1-deg. declination) to mounts. For even more objects, Sky Tour can now interface with TheSky astronomy program from Software Bisque, Inc. through your PDA or laptop. Sky Tour can be ordered factory installed or added later as an upgrade. Read our Sky Tour page for complete list of features.